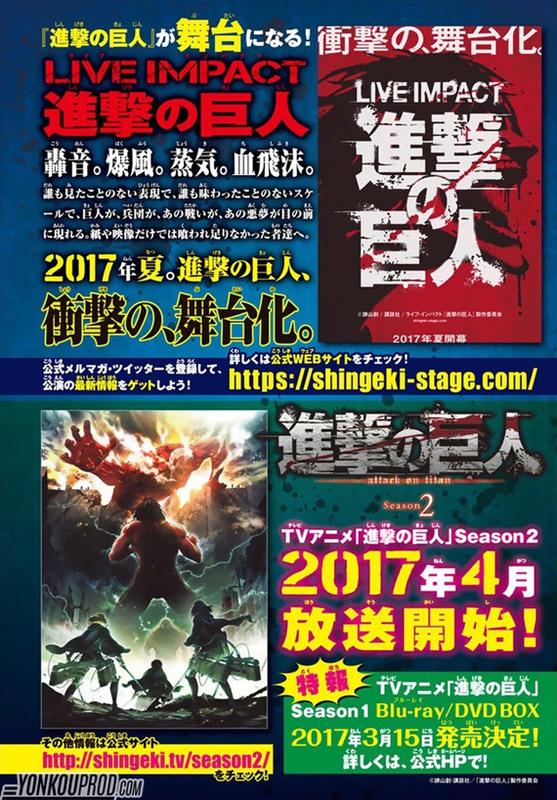 The wraparound jacket band on the 21st volume of Hajime Isayama's Shingeki no Kyojin manga is revealing on Friday that a stage play adaptation of the manga is planned for summer 2017. The Titans, soldiers, and "that battle" will appear in a way no one has seen before, promised by the first stage play adaptation of the manga. The announcement also reveals that the second season of the anime adaptation will premiere in April. The original manga has inspired a television anime, numerous spinoff manga, several novel series, a two-part live-action film project, a spinoff live-action television series, and an original video anime (OVA). It also inspired an anthology graphic novel featuring short stories from western comic artists on October 18. The first 25-episode television anime aired from April 2013 to September 2013. It also inspired two compilation anime movies in 2014 and 2015. Attack on Titan: No Regrets and Attack on Titan: Junior High, the two spinoff manga received anime adaptations of their own. Shingeki no Kyojin manga began serialization in Bessatsu Shōnen Magazine in 2009, and has been collected into 21 volumes as of December 2016.